Wind. Thunder. Pouring rain. Finally a real winter storm is visiting Menlo Park, even though the calendar still says autumn. 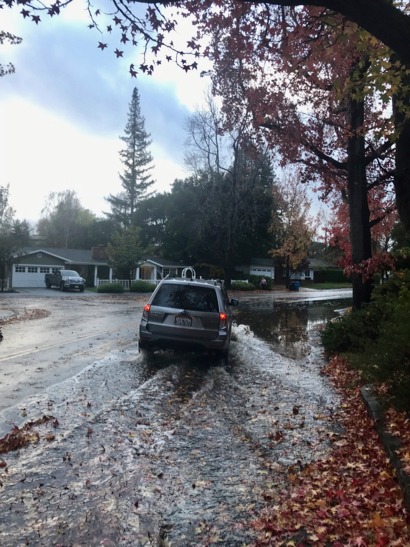 Emailed InMenlo weather watcher Bill Russ earlier this morning: “I was awakened at 4:00 am by a downpour of rain. Then I heard it passing through the outside downspout. Aren’t the storm sounds wonderful?!! All that wind adds up to leaves being ripped from the trees, with as much fall color on the ground as above, along with downed umbrellas like the one we spotted on Lutticken’s roof. And all the rain makes for some puddles that are becoming mini lakes.